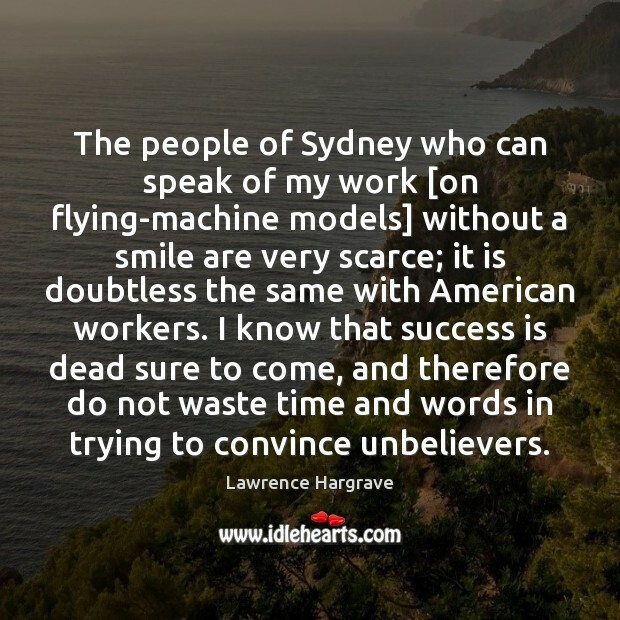 Quotations about American Workers. Quotes to stimulate mind and drive action! Use the words and quote images to feed your brain inspiring things daily! 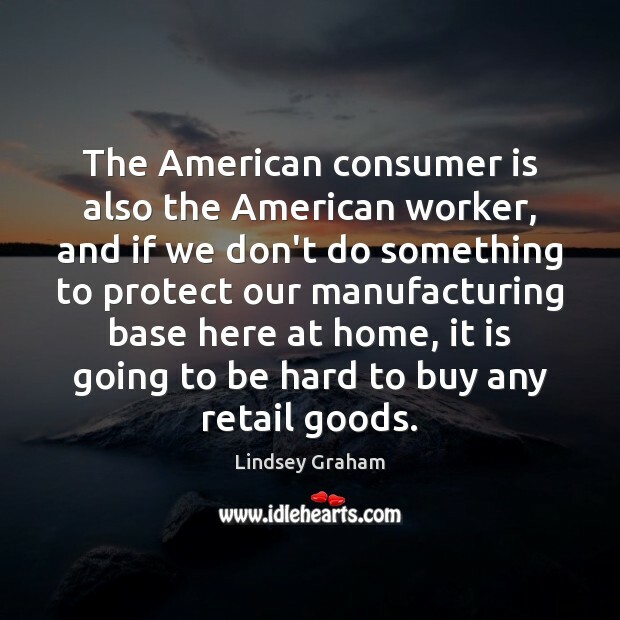 We have seen numerous instances in which American businesses have brought in foreign skilled workers after having laid off skilled American workers, simply because they can get the foreign workers more cheaply. It has become a major means of circumventing the costs of paying skilled American workers or the costs of training them. 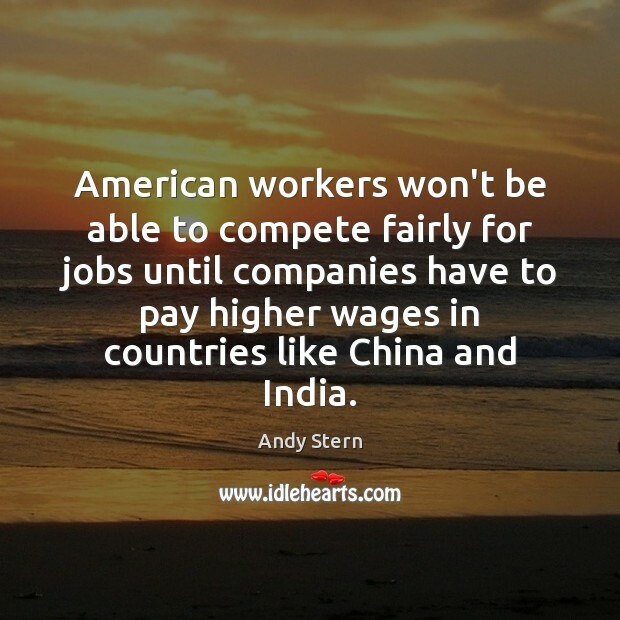 American workers won't be able to compete fairly for jobs until companies have to pay higher wages in countries like China and India. Getting fired can produce a particularly bountiful payday for a CEO. Indeed, he can 'earn' more in that single day, while cleaning out his desk, than an American worker earns in a lifetime of cleaning toilets. 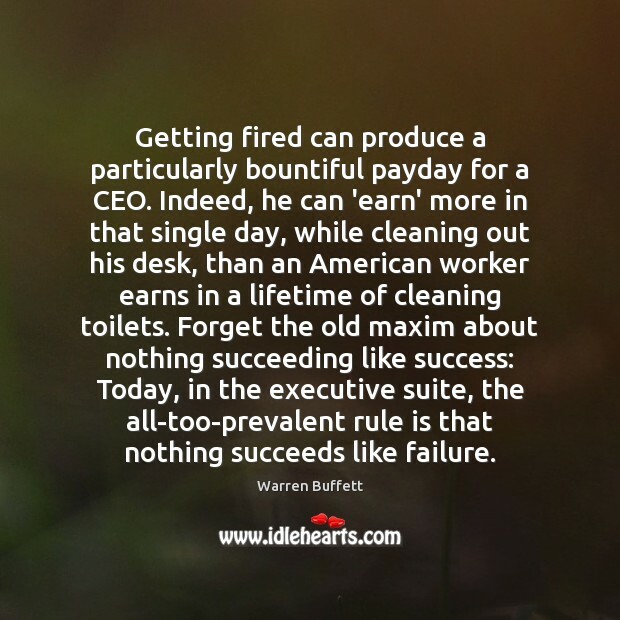 Forget the old maxim about nothing succeeding like success: Today, in the executive suite, the all-too-prevalent rule is that nothing succeeds like failure. 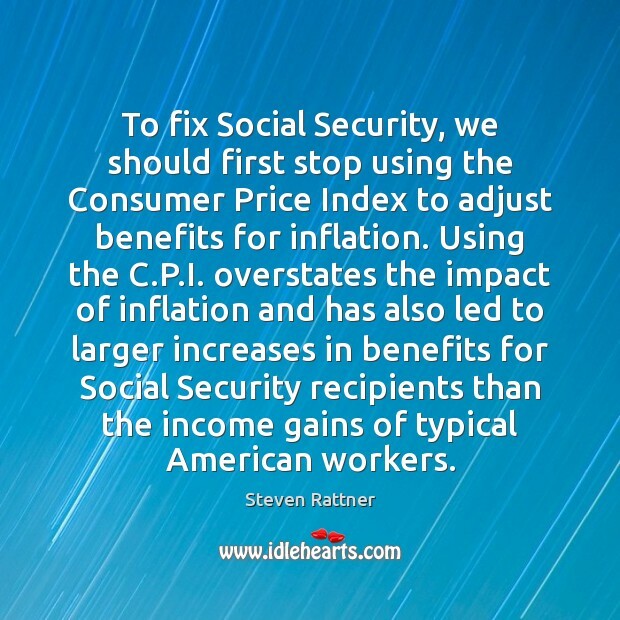 To fix Social Security, we should first stop using the Consumer Price Index to adjust benefits for inflation. Using the C.P.I. overstates the impact of inflation and has also led to larger increases in benefits for Social Security recipients than the income gains of typical American workers. 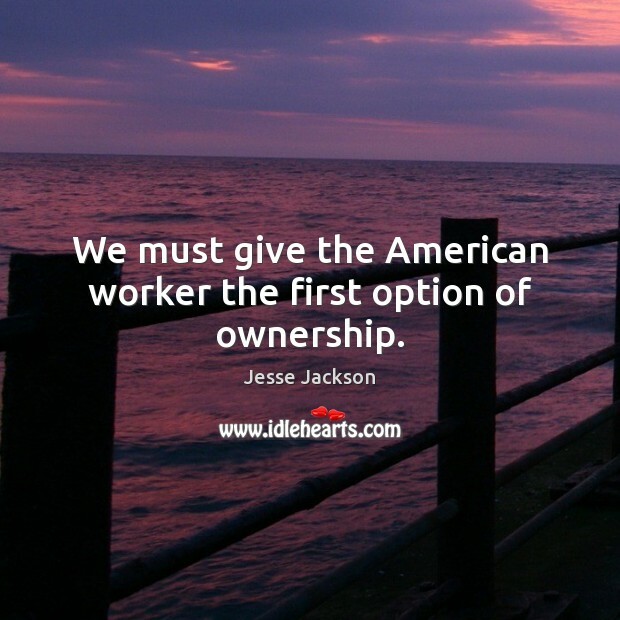 We must give the American worker the first option of ownership. 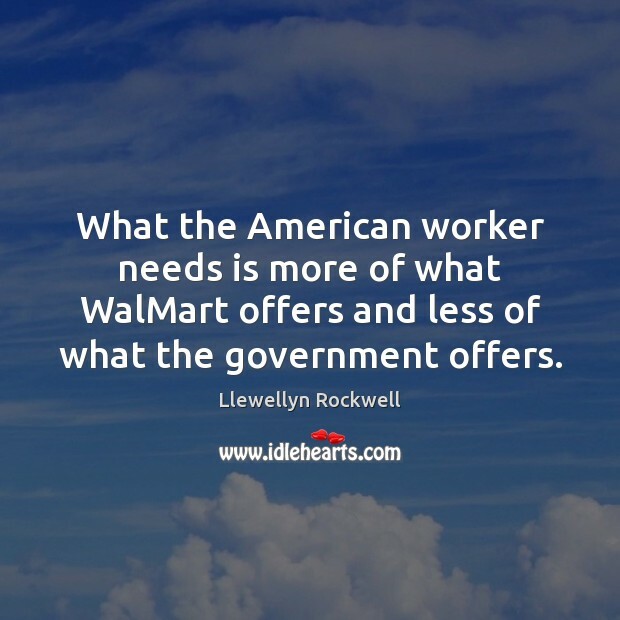 What the American worker needs is more of what WalMart offers and less of what the government offers. NAFTA, supported by the Secretary cost, us 800,000 jobs nationwide, tens of thousands of jobs in the Midwest. Permanent normal trade relations with China cost us millions of jobs. 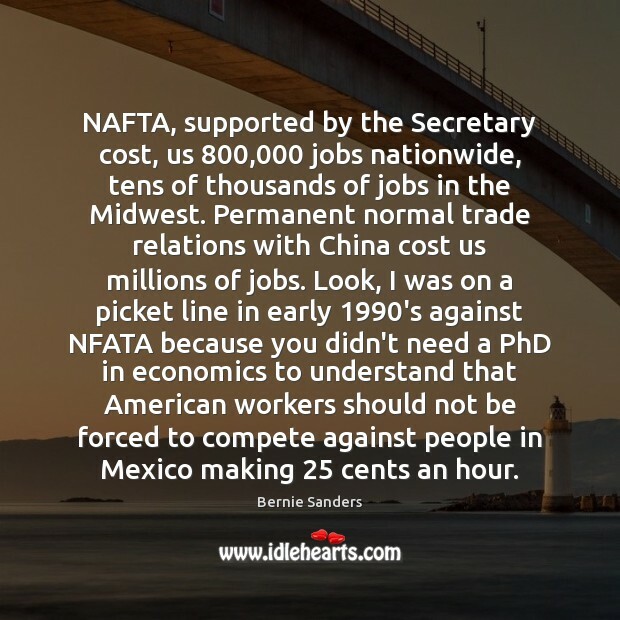 Look, I was on a picket line in early 1990's against NFATA because you didn't need a PhD in economics to understand that American workers should not be forced to compete against people in Mexico making 25 cents an hour. 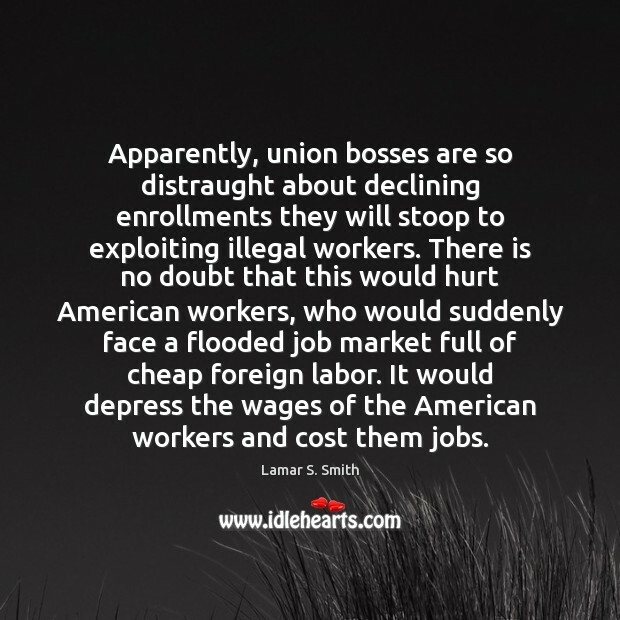 Apparently, union bosses are so distraught about declining enrollments they will stoop to exploiting illegal workers. There is no doubt that this would hurt American workers, who would suddenly face a flooded job market full of cheap foreign labor. It would depress the wages of the American workers and cost them jobs. If American workers are being denied their right to organize and collectively bargain when I'm in the White House, I will put on a comfortable pair of shoes myself and I will walk on that picket line with you as President of the United States of America. Because workers deserve to know that somebody is standing in their corner. Many of my students assume that government protection is the only thing ensuring decent wages for most American workers. 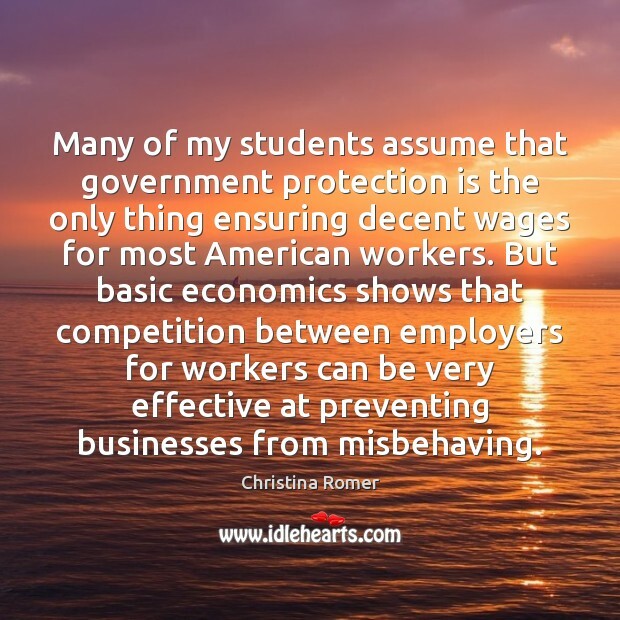 But basic economics shows that competition between employers for workers can be very effective at preventing businesses from misbehaving. 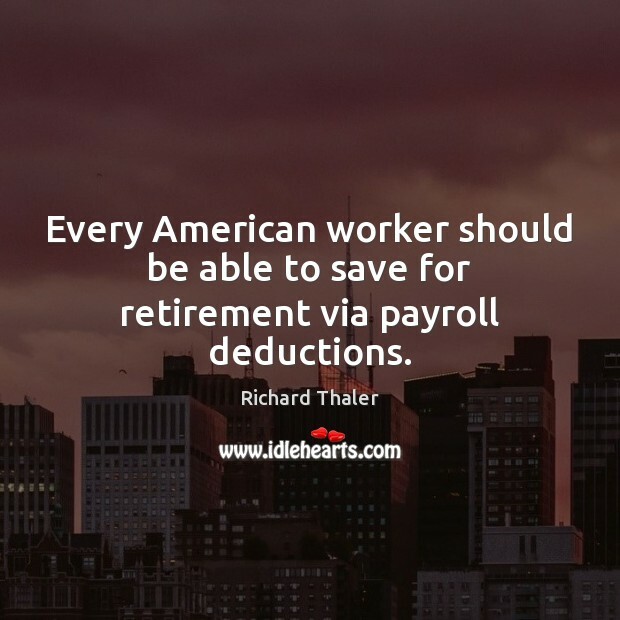 Every American worker should be able to save for retirement via payroll deductions. 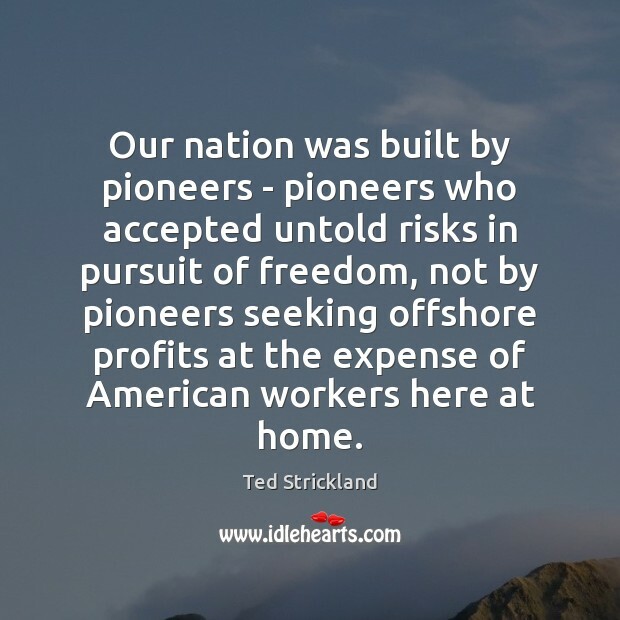 Our nation was built by pioneers - pioneers who accepted untold risks in pursuit of freedom, not by pioneers seeking offshore profits at the expense of American workers here at home. The TPP is another corporate-backed agreement that is the latest in a series of trade policies which have cost us millions of decent-paying jobs, pushed down wages for American workers and led to the decline of our middle class. We want American companies to create decent-paying jobs in America, not just low-wage countries like Vietnam, Malaysia or China. 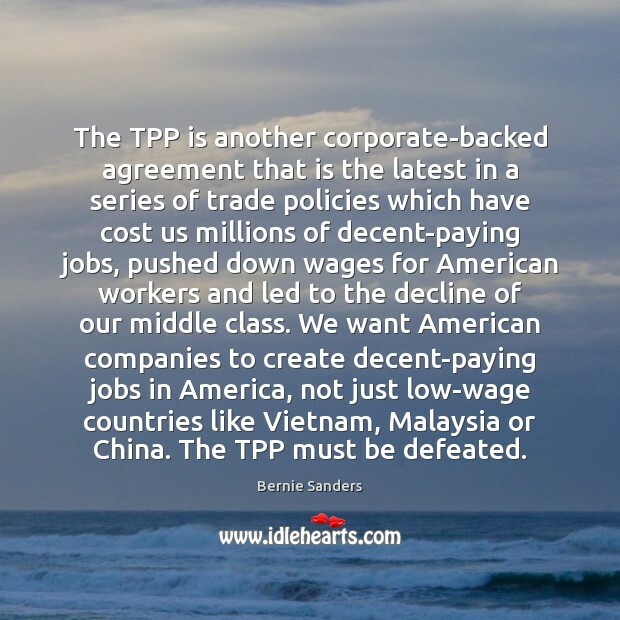 The TPP must be defeated. 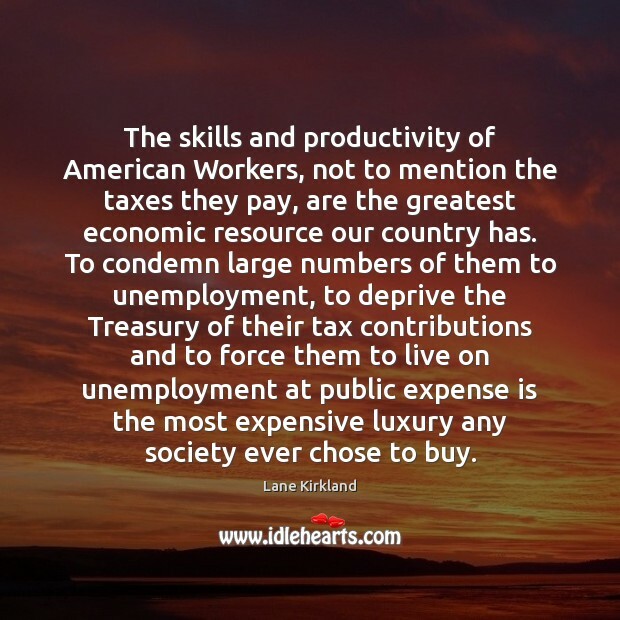 The skills and productivity of American Workers, not to mention the taxes they pay, are the greatest economic resource our country has. To condemn large numbers of them to unemployment, to deprive the Treasury of their tax contributions and to force them to live on unemployment at public expense is the most expensive luxury any society ever chose to buy.